This topic contains 9 replies, has 3 voices, and was last updated by tonydavies 4 years, 6 months ago. One to tax the little grey cells. Doing some research on my family tree, I came across some baptism records for my family, the Elwells, which gave the address as either Tunnel or The Tunnel. The baptisms were all carried out at Holy Trinity, Heath Town, in the mid to late 1800s. Having studied the 1901 OS map for that area, the only tunnel I can find is the railway tunnel under the junction of Wolverhampton Road and Dean’s Road. The family were later living at Wolverhampton Road, Heath Town. Does anyone have any knowledge of the peculiar address? Just realised I’d put this in “People” instead of “Places”! Apologies. Sorry Tony, There were many strange place names scattered in the back streets and courts in Wolverhampton at one time, You wouldn’t think someone would have the nerve to call a small row of terraced houses in Wolverhampton “Paradise” in the 1800’s But they did. But regarding the “Tunnel”I am well and truly in the dark on that one. I found some Elwells (Thomas and Naomi, children John, Alice and Thomas) in Heath Street Wednesfield (Heath town, almost) which was a street of back to back houses near to Grove Street and the railway tunnel you mention. I am glad Bob mentioned the thread again regarding the “Tunnel” as this name persisted in coming back to me ,so I got intouch with an old friend that worked and lived close to Dean’s Road in the 1950’s. He told me the locals used the Old “Manly Arms” on the corner of Wolverhampton Road and Deans Road, and would you believe it the nickname of the pub was The Tunnell. I suppose this was due to the Grand Junction Railway tunnell that went beneath the road at the side of it. And of course Holy Trinity Church is a stones throw away . All very interesting Billy. I suppose one question would be, “was the Manly Arms around in the mid 1800s?” I suppose it’s possible that Enoch and his family were in “digs” there. The Elwell family seems to be quite a big one. Bilston, Sedgley, Wolverhampton, and Cheslyn Hay all have them. My own interest is of the Heath Town family of Enoch and Sarah of Wolverhampton Road, Heath Town. Enoch, my Great, Great-grandfather, came to a particularly horrific end, when a boiler he was working near at the Lanesfield Ironworks exploded, killing him instantly. A newspaper of the time stated that he was “dreadfully burned”. Also killed was one John Shorthouse, the boiler fireman, whose body was “shockingly mutilated”. Even though the boiler had been examined and found to be “not in a sufficiently good condition for assurance” and that although it was originally designed to work at 32lbs pressure per sq.in. it had been repaired so many times that it was recommended that the pressure should not exceed 20lbs per sq in, it continued to be worked at full capacity. The inquest ruled that the owner, Mr H de Simencourt, was not under any obligation to adhere to the recommendation of the Inspector Midland and Steam Boiler Inspection and Assurance Company, and had simply used his discretion to carry on using the faulty boiler. The jury at the Inquest returned a verdict of “Accidental Death” on the two unfortunate fatalities. I dare say neither family received any form of compensation for their losses. Enoch was only in his early thirties when he died leaving a wife and family to fend for themselves. He is buried in Holy Trinity churchyard. Terrible tragedy Tony – yes factory life was no cup of tea in those days I suppose it depended on the generosity of the factory owner what little compensation you got. At least Enoch was sufficiently well placed to have a decent burial at Holy Trinity, Heath Town, not like the many who died in similar circumstances now in unmarked graves in Merridale. True Billy, although I was only able to find Enoch’s grave with the help of the people at Holy Trinity as there is no headstone marker. Infant mortality also took it’s toll on the Elwells, as it did on so many families of that era and, again thanks to some sterling work by the staff at Holy Trinity, I’ve managed to locate two of Enoch’s children. Both sadly preceded him to the great beyond. Scrolling through my files I came across this old photograph taken originally from a glass plate. 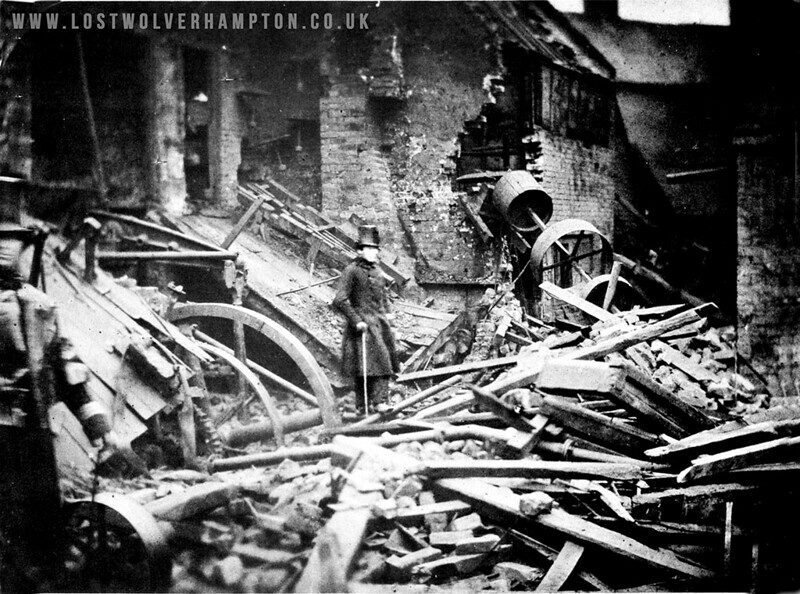 It shows Mason’s workshop in Walsall Street, after a devastating boiler explosion in 1857. Benjamin Mason was a fire-iron manufacturer. Several persons were killed by the explosion, and the east window of St Georges church was shattered. I suppose it was lucky that only two people were killed in the explosion. The injured were variously stated as between three and twenty. I have newspaper reports from the Birmingham Daily Post, London Standard, Cheshire Observer, and the Sheffield and Rotherham Independent, so the next stop is Wolverhampton archives to get the report from the Express and Star.